Q8-DEWANIYA: Macdonald's new spicy mcroyale! A blog that talks about the latest trends in Kuwait and helps you to find the right place to go! 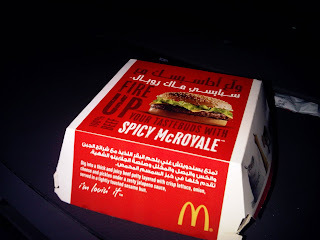 It is the same mcroyale sandwich with a spicy sauce taste like sweet chili sauce. 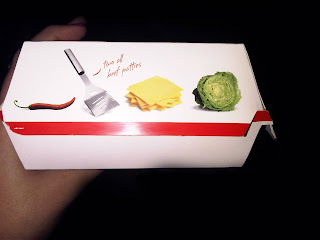 Now what i really liked about the sandwich is the box, remember when i wrote about London sandwiches box (click here)? nearly the same is happening with this box but just the contains in sandwich by nice icons without the details. ohh did they just have these boxes in kuwait? ok. now i'm hungry !